But how do I know which initial settings will lead to flow? How do I train myself to set things up the right way? Or an even better question, how to I make myself into a good designer? 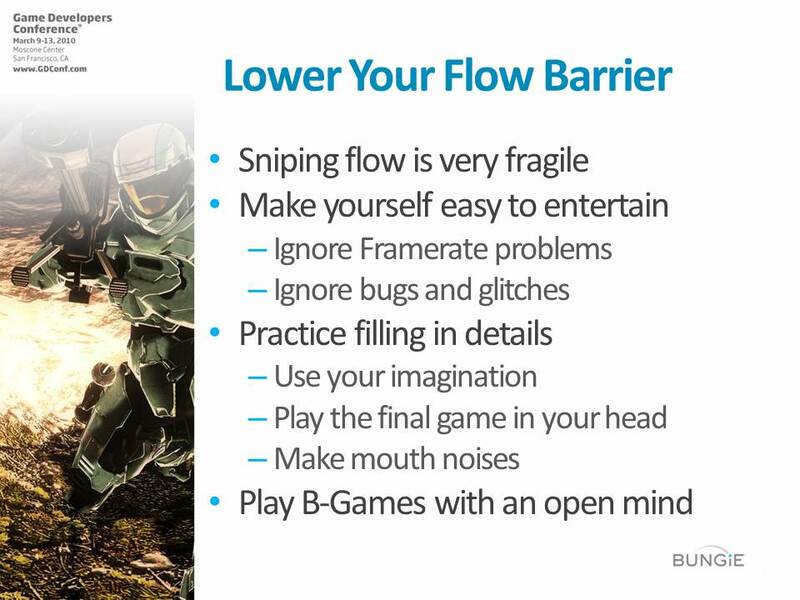 Sniping flow is very fragile because it is so easy to break. Distractions, misses, and frustration abound. It can be difficult to focus, especially when you are first setting a game up. 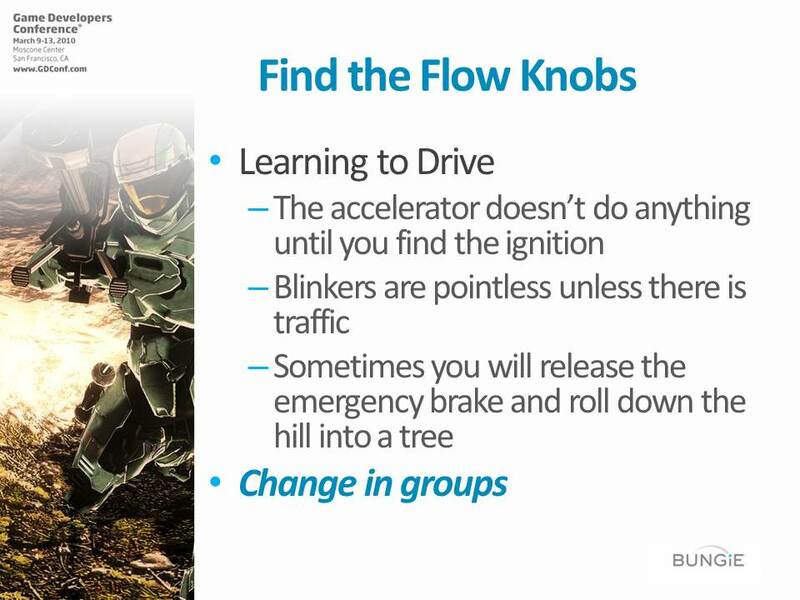 They key is to master your own flow so that you can control the amount of distraction it takes to break your rhythm. First, make yourself easy to entertain, so you while you are setting it up you can put yourself in a mindset that allows you to maintain flow. Practice filling in details that don’t exist yet. I’m not kidding, get your mouth engaged! I make motor noises when balancing the Warthog and say “pew-pew” for guns. Kids are easy to entertain because they make up the fun as they go along. Another technique is to play B-Games with an open mind. Try to see the fun in spite of all the problems. 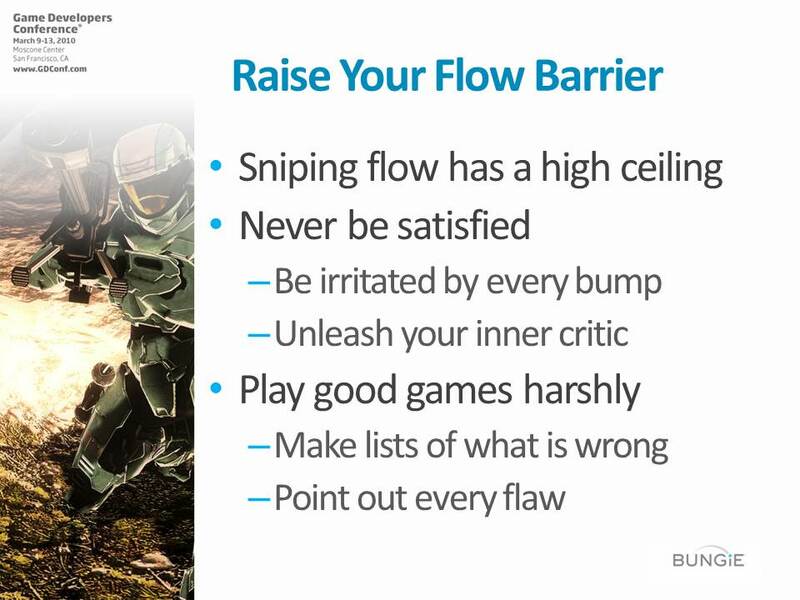 If you can’t have fun with an imperfect game, you won’t be able to find the flow in your own imperfect game. 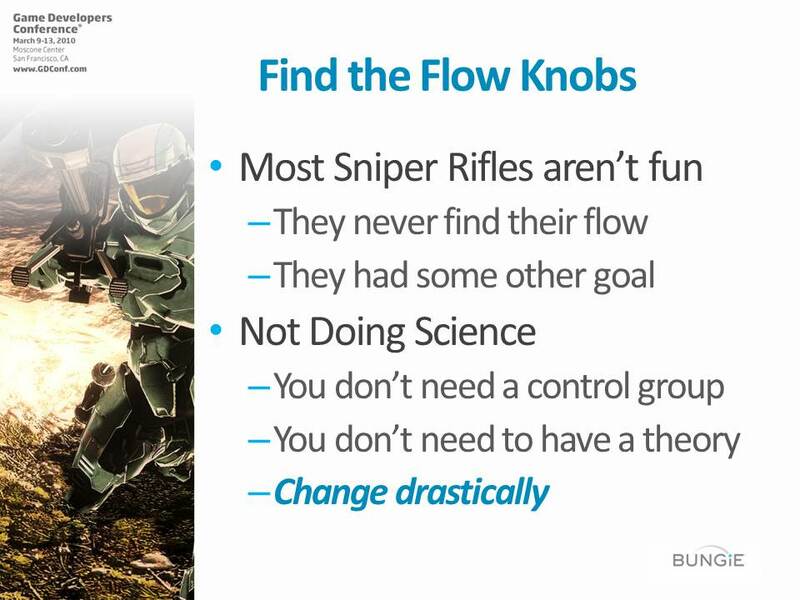 Control over Flow is the essential design skill. 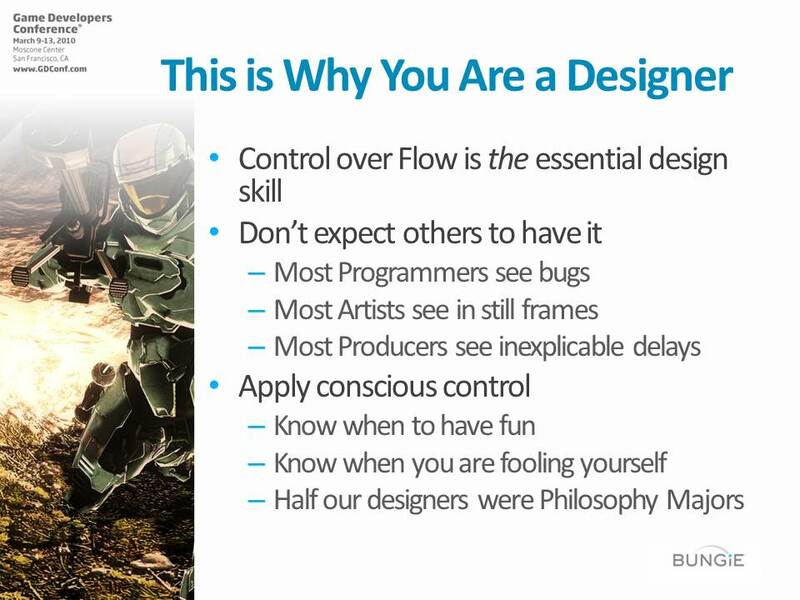 In my opinion, control over flow is what makes someone a good designer. Don’t expect other disciplines to have it. Most Programmers see bugs. Most Artists see in still frames. Most Producers see inexplicable delays. But as a designer you should cultivate this conscious control. I imagine a fun thermostat inside my head that I can set at will. I hate to say it, but most Sniper Rifles aren’t fun. And sniper rifles are easy compared to some things. I believe it is because so many designers skip past this stage and assume that they will be able to make it fun at the end, but find the fun first at all costs! Remember, you aren’t doing Science, you don’t need a control group. Just change stuff and try different configurations. This is why you do this step in private; you don’t need everyone to know all the dead ends you ran down. Imagine you were trying to teach yourself how to drive. If you just fiddled with one control at a time, you might never figure it out. Pressing the accelerator before you find the ignition doesn’t do anything. You might misinterpret the turn signal until you see how the car operates in motion. Again, this is not science, it is training. You are training your powerful emotional brain through dopamine, and if you leave things static your brain will stop trying to figure it out. Daniel Tammet has Asperger’s disease and it has given him amazing skill with numbers. 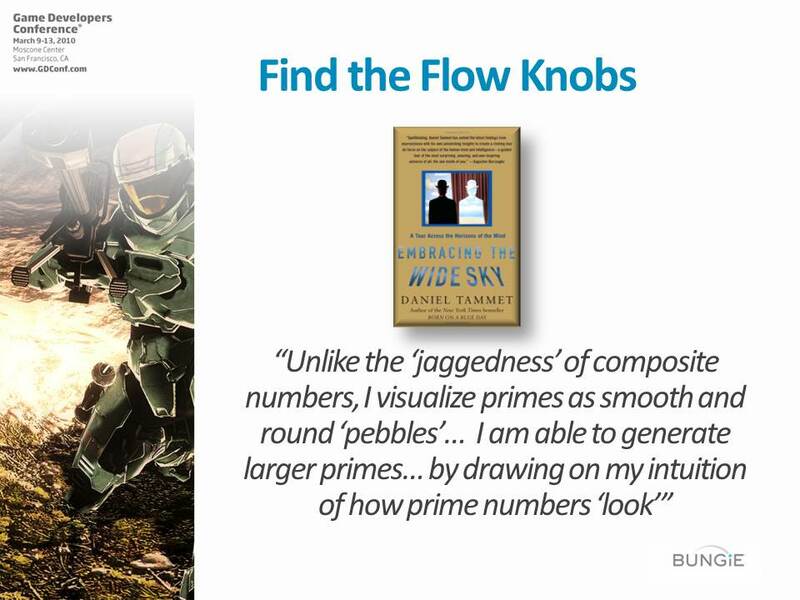 He can just intuitively spot prime numbers. Everyone has this power to more or less extent. For me, there is an audible click when something hits the sweet spot, like a record player falling into the groove, that lets me know when something is going to be fun for players. So, go with your gut! Trust your heart. Reach out with your feelings? 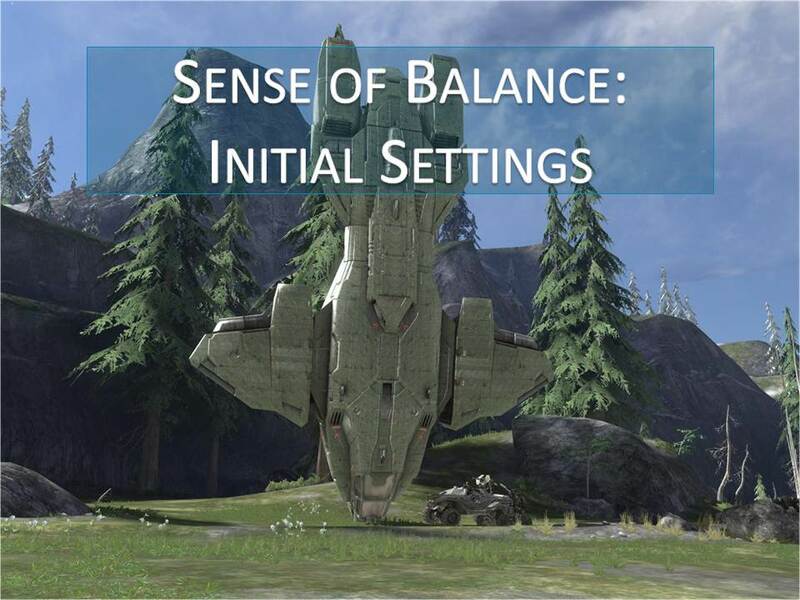 This entry was posted in Balancing, Development and tagged autoregulation, flow, sense of balance. Bookmark the permalink.